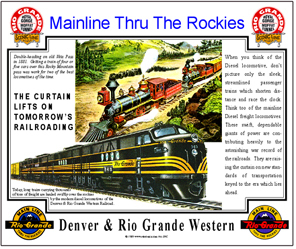 Mainline thru the Rockies, not around them. Products bearing individual marks are licensed marks owned by Union Pacific Railroad Company and are used under an active license agreement. 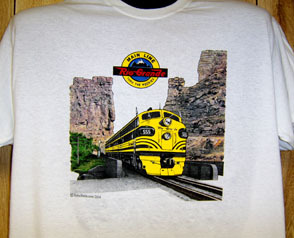 NEW t-shirt showcasing a powerful set of Rio Grande F-unit freight diesels plowing through beautiful Castle Gate Pass in Utah. NEW DESIGN. Powerful Rio Grande diesels emerging from the famous Moffat Tunnel in the Colorado Rocky Mountains. 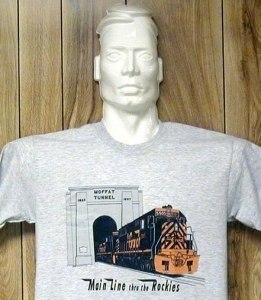 What more can you say about this truly iconic image of the Denver & Rio Grande Western Railroads famous Moffat Tunnel. 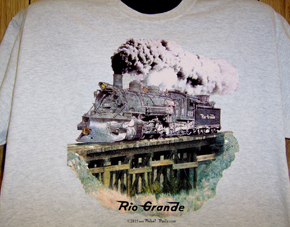 Narrow gauge steam locomotive of the Rio Grande Railroad rolling over a wooden trestle in the Great Southwest. 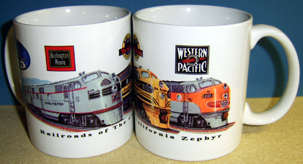 Unique mug illustrates the three railroads that carried the California Zephyr across country, the WP, D&RGW and the CB&Q. The CZ logo along with each railroads logo is brightly displayed over each diesel. 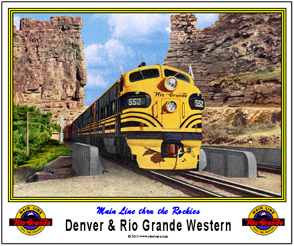 Rio Grande early F-Unit diesel rolling through Castle Gate pass. 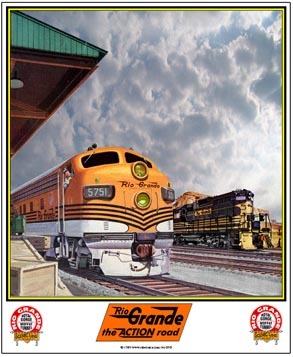 Colorful Rio Grande coffee mug featuring new F and GP diesels doing their jobs at a station stop. Rio Grande F-3 diesel coffee mug in its as delivered from the factory paint scheme. Rio Grande diesel emerging from the famous Moffat Tunnel in beautiful Colorado. Colorful Rio Grande coffee mug featuring its famous Thru The Rockies logo superimposed over its diesel color scheme. 6 inch x 6 inch square tin Moffat Tunnel logo of the Denver & Rio Grande Western Railroad. 6 inch x 6 inch square tin sign of the Denver & Rio Grande Westerns Rio Motor Way truck division. A very rare logo. 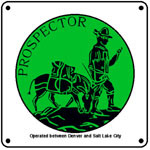 6 inch x 6 inch square tin sign of the Prospector logo and drumhead used by the Denver & Rio Grande Western Railroad for its train between Denver and Salt Lake City. 6 inch x 6 inch square tin Red Letters logo sign used by the Denver & Rio Grande Weswtern Railroad. 6 inch x 6 inch square tin Scenic Line logo sign of the D&RGW RR. Classic Denver & Rio Grande Western logo is featured on this quality license plate. Remember, Thru the Rockies, Not around them. 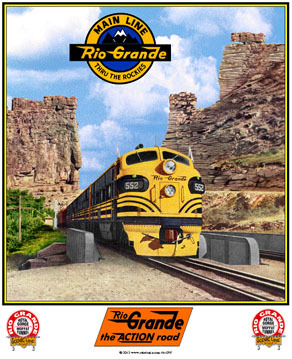 Rio Grande Mouse Pad featuring an EMD F-unit freight diesel rolling through Castle Gate in the Great Southwest. Historic logos also adorn this colorful pad. 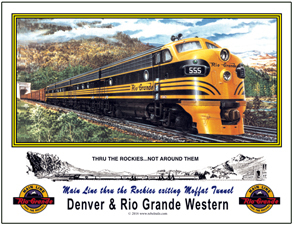 Rio Grande Mouse Pad featuring a new F-unit diesel just exiting the famous Moffat Tunnel through the Rockies, not around them. 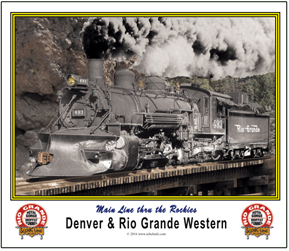 Rio Grande Mouse Pad featuring a narrow gauge steam locomotive crossing a wooden trestle in the rugged Colorado Rockies. 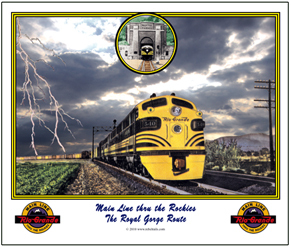 Rio Grande Mouse Pad featuring a long freight train headed up with F-diesel racing a Colorado storm below the foot hills of the Rockies. 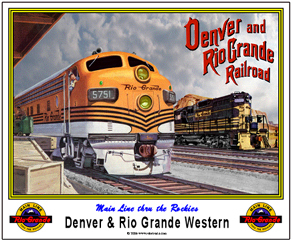 Rio Grande Mouse Pad featuring an F-unit at the small southwestern station and a GP-unit awaiting switching orders on the far track. A nostalgic and colorful mouse pad. 6 inch x 6 inch square tin The Action Line logo sign of the Denver & Rio Grande Western Railroad, thru the Rockies, not around them. Scene of a Denver & Rio Grande Western manifest freight train rolling across a short bridge in Castle Gate, Utah. 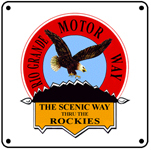 Three different Rio Grande logos are depicted on this sign. 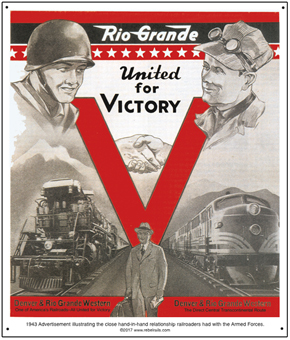 Advertisement by EMC promoting the arrival of new FT diesels on the property of the Denver & Rio Grande Western Railroad. 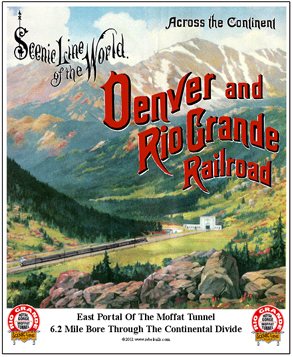 Beautiful scene of the Denver & Rio Grande Western Railroad, the Scenic Route of the West, as a steam passenger train is about to enter the east portal of the famous Moffat Tunnel. Thru the rockies, not around them! A nostalgic small town station scene along the Denver & Rio Grande Western Railroad. An EMD F7 covered wagon diesel is near the loading platform while an EMD GP9 awaits switching orders on a siding. Storm clouds seem to be gathering in the distance. Scene of an old steam powered passenger train stopped in the Royal Gorge on the Denver & Rio Grande Western Railroad, the Scenic Route of the West. Thru the rockies, not around them! 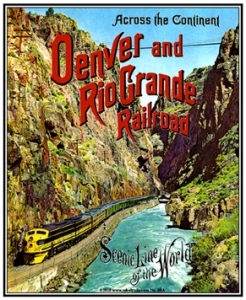 Unique sign featuring a reproduction of a war time advertisement ran by the Denver & Rio Grande Western Railway. 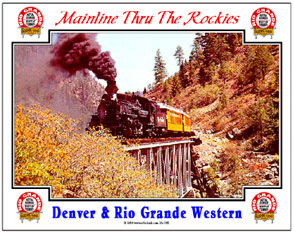 Beautiful scene of a narrow gauge Denver & Rio Grande Western train crossing a curved wooden trestle in a beautiful western America scene. 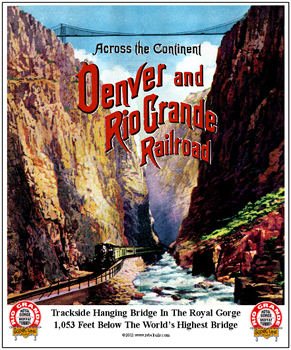 The beautiful Royal Gorge on the Denver & Rio Grande Western Mainline Thru The Rockies. The D&RGW Railroad used to stop its passenger trains in the Gorge to allow passengers to detrain and enjoy one of Americas best loved rail travel wonders.